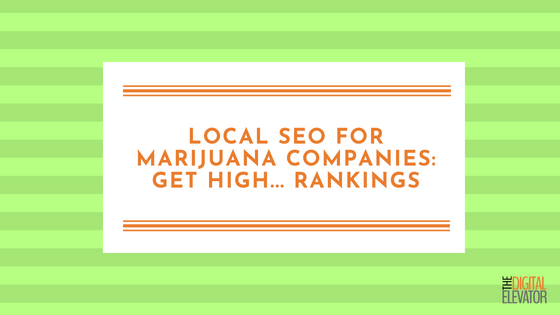 Are you a medical marijuana physician, dispensary, or cannabusiness that is trying to get some local SEO traction in this highly regulated industry? At Digital Elevator, we have worked with several local medical marijuana clients and have achieved great results in what is a difficult marketplace to navigate considering the advertising restrictions on the industry. Today, we are going to share how we achieved some of those same results and provide you the steps so you can do the same for your medical marijuana doctors office/dispensary or cannabiz. If you aren’t in the medical marijuana space, don’t fret, these tips will work for your recreational marijuana business too. Despite some of the roadblocks you might have faced trying to get into Google’s “map pack,” it is very possible to get your business listed -- and ranked -- in the Google Map via Google My Business. The caveat for medical marijuana physicians is that there is no category for “medical marijuana doctors.” If this is you, you’ll want to select the category “Alternative Medicine Practitioner” as this seems to be the most relevant, and for our clients, it seems to work well. “What about ranking for cannabis-related searches,” you ask? I’ll cover that below in the on-page SEO section and refer to other things that influence your ability to rank. Recently, Google opened up a category for marijuana dispensaries: Cannabis store. 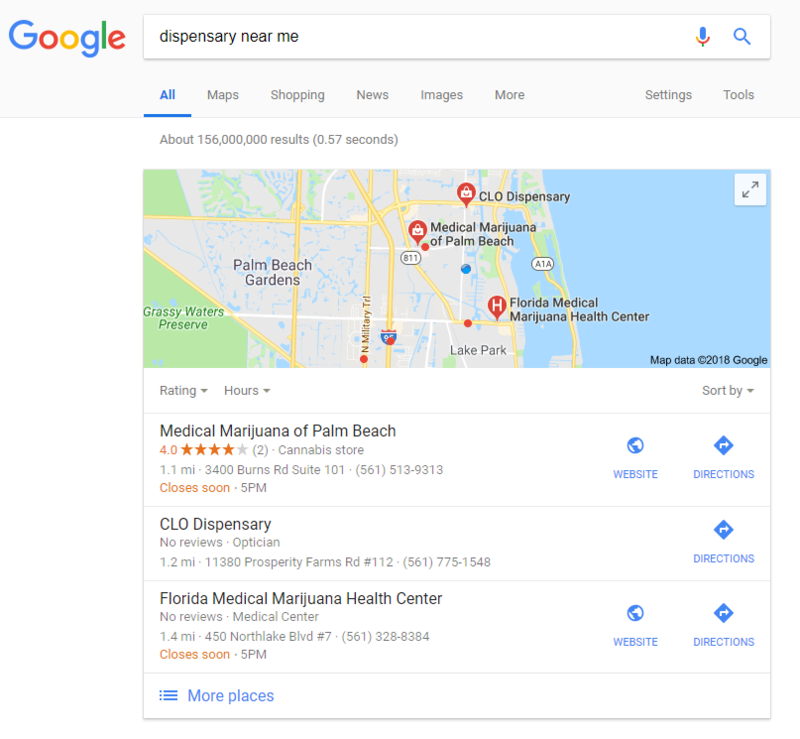 This is good news for dispensaries who were struggling to get some local SEO traction, and may also point to some good news for doctors as it seems the search giant is slowly moving towards industry trends. Formerly, you might have seen dispensaries filing under “Alternative Medicine” or “Medical Center” as seen below. Not sure what the company below was smoking when they used “Optician” as their category? In an older, but still relevant, post on local SEO ranking factors the quality and authority of structured citations was mentioned as one of the most important ranking factors for a brick-and-mortar. A citation is merely the mention of a business on the web, and one of the best ways to get these is through directory listings such as Yelp!, Bing, YellowPages, FourSquare, etc. You can choose to manually build out directory listings (here is a link to 40 directories) or you can hire a local SEO company to do it for you, or you can contract with a citation building company such as BrightLocal or Whitespark. The directories mentioned above (Yelp!, Bing, etc.) fall into general directories, meaning they will list nearly any business on the planet. Marijuana-specific directories are those that only list businesses in one primary vertical: marijuana. Examples of marijuana vertical-specific directories include Leafly or WeedMaps. These niche directories tend to be better from a user point of view -- meaning they are more likely to attract people who are interested in your marijuana business and they often rank better than your site might. Whitespark, the latter of the two citation building companies mentioned above, specializes in finding niche directories. Combining a bunch of general directory listings and niche directories will help you rank in Google’s map pack as well as organically. While you could do this step first, you’ll want to optimize your site for your locale. You can refer back to the previously mentioned blog on local SEO ranking factors to learn more about this topic, but the short version is that you’ll want to optimize your title tags and meta descriptions for local searches. [Business Name] is a marijuana dispensary located in West Palm Beach, FL. We we provide cannabis, weed, concentrates, and edibles. Click here to learn about our friendly staff and amazing prices. Each page on your site should have a unique title tag and meta description, and this, combined with the Google My Business listing and citations, should help you rank locally. Do you have more than one brick-and-mortar marijuana business? Check out this guide on multi-location local SEO to learn more about how to structure your website. Local SEO reviews are playing a bigger and bigger part of rankings than ever before. On Moz’s local search ranking factors list, they come in at 5 out of 10 in terms of correlation to ranking. If you are new to creating a 5-star review strategy, check out our post on the topic. You’ll want to encourage your happy clients to leave reviews on the most popular directories (usually Google and Yelp). To take this a step further, you’ll want to ask them to mention the marijuana service they received in their review. This is especially important for medical marijuana doctors as they don’t have the category in Google. For example, a patient who says something like “I went to [physician name] for my medical marijuana ID card recommendation and the process was great” can actually help your ranking ability. These mentions of medical marijuana (or products if you are a dispensary), can actually provide a signal to Google which helps you rank for searches that have similar terms in them. Links continually play a huge role in SEO and will continue to do so into the foreseeable future. Generally speaking, having more links than your competitors will mean that you will outrank them. While it is not as simple as that, that is the gist of what we will cover today. For information on local link building, check out this resource. A good place to start generating links is from some of your existing business contacts. For example, if you are a dispensary, reach out to all the doctor’s offices that refer medical marijuana patients to you and ask them to link to your site. If you are a medical marijuana doctor, connecting with other non-qualified physicians and getting them to link to your site -- or guest blog on MMJ topics on there site for example -- is a good way to get the ball rolling. There are a lot of restrictions on the marijuana industry making it hard for startups to get moving. For example, you can’t pay to promote content on Facebook and advertising on AdWords is difficult -- but we have done it successfully for some clients. This means cannabusinesses have to invest heavily in SEO and content marketing, growing their companies somewhat organically (pun intended). While there looks to be some potential for some of the media companies like Google to open up the doors a little, most medical marijuana businesses should focus on search engine optimization and hitting it hard here until they can gain access to other advertising options. That said, we are specialists in marijuana advertising and have relationships with media companies that allow paid ads. So, if you are looking for fast track business exposure, call us and we’ll let you know what options are available for your cannabrand. These are most of the local cannabis marketing and advertising tips and tricks that we are currently using for our clients in addition to some of our more traditional SEO services. If you have any other experiences in this vertical or want to contribute a tip that has worked for you, please leave a comment. If you have any questions about these practices or are looking for experienced cannabis marketers, please contact us to discuss your unique project.